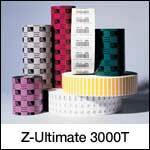 The Z-Ultimate 3000T is a pearl white topcoated polyester thermal transfer facestock with permanent acrylic adhesive. Ideal for thermal transfer applications that require outstanding print quality and unparalleled smear and scratch resistance. Recommended for use in a wide variety of applications, including shelf or pallet labels, water-immersed labels, or labels in contact with moving parts. Use with resin ribbon. 2.00" x 0.50" thermal transfer polyester label on a 1" x 5" core. 4550 labels per roll / 8 rolls per case. Zebra 18943 special features - Perforated. Use with resin ribbon. 2.00" x 1.00" thermal transfer polyester label on a 1" x 5" core. 2530 labels per roll / 12 rolls per case. Zebra 17157 special features - Perforated. Use with resin ribbon. 2.00" x 1.25" thermal transfer polyester label on a 1" x 5" core. 2070 labels per roll / 8 rolls per case. Zebra 18940 special features - Perforated. Use with resin ribbon. 3.00" x 1.00" thermal transfer polyester label on a 1" x 5" core. 2530 labels per roll / 8 rolls per case. Zebra 18939 special features - Perforated. Use with resin ribbon. 3.00" x 3.00" thermal transfer polyester label on a 1" x 5" core. 910 labels per roll / 8 rolls per case. Zebra 18942 special features - Perforated. Use with resin ribbon. 4.00" x 2.00" thermal transfer polyester label on a 1" x 5" core. 1340 labels per roll / 4 rolls per case. Zebra 18950 special features - Perforated. Use with resin ribbon. 4.00" x 6.00" thermal transfer polyester label on a 1" x 5" core. 460 labels per roll / 4 rolls per case. Zebra 18941 special features - Perforated. Use with resin ribbon.